Manama, Oct. 14 (BNA): HM King Hamad bin Isa Al Khalifa, in a phone conversation held today with the Custodian of the Two Holy Mosques King Salman bin Abdulaziz Al Saud of Saudi Arabia, affirmed Bahrain's strong solidarity with Saudi Arabia, which stems from common destiny and goals bonding the two kingdoms. 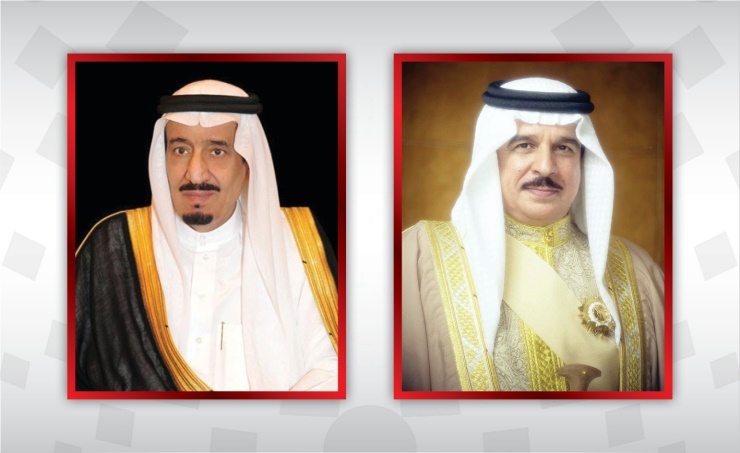 HM the King stressed the Kingdom of Bahrain’s standing by the Kingdom of Saudi Arabia against aggressive campaigns targeting its security and stability. HM the King expressed Bahrain’s, leadership and people, belief in the Kingdom of Saudi Arabia led by the Custodian of the Two Holy Mosques King Salman bin Abdulaziz Al Saud and HRH the Crown Prince, highlighting admiration of its development and modernization process seen by all walks of life and its ongoing effort to maintain the international security and stability. HM the King prayed to Almighty God to bless the Kingdom of Saudi Arabia with further security and stability under the leadership of the Custodian of the Two Holy Mosques King Salman bin Abdulaziz Al Saud and HRH the Crown Prince. The Custodian of the Two Holy Mosques King Salman bin Abdulaziz Al Saud expressed appreciation of HM the King’s noble feeling and Bahrain’s genuine supportive stances toward the Kingdom of Saudi Arabia, which reflect the depth of the longstanding relations bonding the two countries and their people, wishing Bahrain further progress and prosperity under the leadership of HM King Hamad bin Isa Al Khalifa.